Yoga has many touted health benefits such as stress reduction, anxiety relief, decreased inflammation, increased heart health, improved sleep quality, and a reduction in chronic pain. Yoga is made up of eight limbs. Yoga classes are typically referred to the asana portion of yoga. Asanas are the physical postures used to help prepare the mind and body for meditation. However, like any practice that involves physical movement, practitioners can run the risk of injury, specifically in regards to the back. As the modern world becomes more confined in desks and chairs behind the computer, the muscles in the hips, hamstrings, and lower back begin to shorten making these areas of the body more susceptible to risk. Since these areas of the body are closely intertwined, it is important to practice with care to help keep the back safe during a yoga practice. When working with the back, practicing often helps keep the body limber and strong. As opposed to doing one long class per week, practicing for shorter periods several times a week constistently will help keep the mind and body at ease. Creating a regular habitual practice helps cultivate the benefits of yoga and protect the lower back. There is no set schedule for optimal success but whatever a person can commit to consistently is the best. To get started, try finding consistent openings in your schedule during the week. The length of time does not matter, for some people it could be 15 minutes daily while others may have 30 minutes a few times a week. Once time is found, setting recurring appointments in the calendar can help maintain regular yoga practice. Yoga is made up of the 8 limbs of yoga. Asana is the third limb of yoga and the physical aspect. There are two other limbs to be practiced prior to learning asana: the yamas and niyamas. Without practicing the yamas and niyamas the benefits of physical posture can become lost or tainted. Ahimsa is the first rung in the first limb of yoga and it makes sense that it is the very first aspect of yoga. Non-violence or doing no harm is not only meant towards others but to the self. When practicing yoga asana, it is crucial to practice ahimsa and do no harm. This means that a practice should be safe and supported versus trying to force the body into postures that are harmful. Ways to support a non-violent practice include making sure the body is properly warmed up, only doing postures that the body is physically ready for, avoiding overstrain, and being aware of contraindications. With the exception of certain practices such as Yin Yoga, the body should be properly warmed up for practice to help keep the back safe. To warm up the body practitioners should address the breath, the joints, and the muscles as well as slowly increasing the heart rate for more vigorous practices. Certain breaths such as Ujjayi can help warm up the body. Students should also focus on the joints while throughout the body as everything is interconnected. Joint freeing exercises such as shoulder rolls, hips circles, wrist presses, and so on can help prepare the body for asana. Like any other form of physical exercise, the heart rate should slowly be brought up as opposed to starting quickly with vigorous movement. Mark Stephens, yoga instructor and author of Yoga Sequencing outlines in his book how poor sequencing can create long-term obstacles, imbalances in the body, physical strain, or injury, and energetic fluctuations. During asana practice, there is typically a physical theme or peak pose. As postures are placed together, each posture should build upon the next in terms of strength and flexibility. Specifically for the back, wheel pose or Urdhva Dhanurasana, should have preparatory postures in advance to help prevent pulling a muscle. Postures such as bridge, cobra, or upward dog will help open the spine before the more intense backbend. Harder and more challenging postures are typically between the halfway to end of a practice and the body should feel as if similar postures have already been practiced. Specifically for the back, the spine should be adequately warmed up before any practice. Cat-Cow is an excellent posture sequence to warm up the back and prepare the body by stretching the torso, neck, and providing a gentle massage to the spine and organs in the belly. Counter poses will also help create a balanced practice for deeply held postures. Counter poses move the body in the opposite direction of the previous pose. For example, a backbend is typically followed by a forward bend, twists to the left are counterbalanced by twists to the right, and internal rotations are followed by external rotations. These counterbalances will help the body stay in equilibrium and is essential for keeping the back safe. A good sequence will also ensure the whole body is balanced throughout the practice. While a yoga practice may be focused on the legs, the arms should not be ignored during the whole practice. When too much time is placed on one area of the body, the body overcompensates or underperforms in other areas increasing the risk of injury. Since the back is central to the body overworking any areas above, below, or in front of it without properly strengthening or stretching the back can cause strain or problems in the long term. Injuries are not uncommon in yoga. While yoga has many healing aspects, if practiced without thought or intention to alignment injury can occur. For example, practicing upward facing dog with poor alignment can injure both the shoulders and the lower back. For some people, working on Cobra to help develop flexibility is key to learn proper alignment, while others need to focus on engaging and lifting the legs during the posture. Another example can be seen in plank pose with too much pressure being placed on the wrists or the hips start to sag creating strain on the lower back. Instead, students need to activate the core and legs distributing their weight evenly throughout the body. 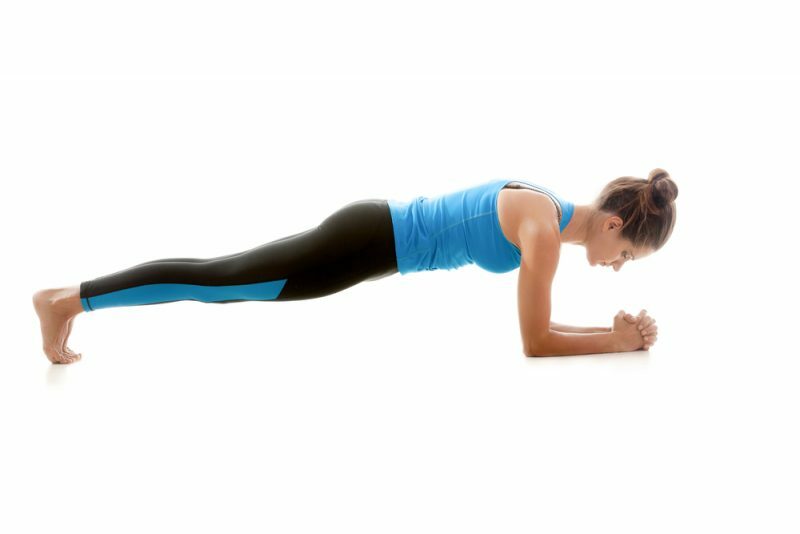 If this is not available to their ability during plank, they can either lower their forearms or knees to the floor to start building proper alignment. Often times in group yoga classes there is not enough time for individual attention to students, especially in larger classes. It is helpful to either get started in beginner yoga classes to learn more about the postures and how the body works in each pose. Books geared towards yoga anatomy can also help students learn how to hold postures safely with proper alignment. All bodies are not built the same way with each person having different abilities. Using props and modifications to poses can help the back stay protected by adapting the posture to the individual’s ability. Props such as blocks, chairs, straps, or even a wall can help yogis practice proper alignment and make modifications to postures as necessary to prevent overstrain. Props allow students to adapt yoga practices to their needs safely and supported while working towards the full expression of the postures. Finding an experienced yoga teacher who is familiar with using props and working with different types in a group class is helpful to learn modifications. If there are no classes available, Iyengar Yoga is a practice that is built heavily around alignment and can help students learn various modifications and use props for alignment. Injuries can often occur in yoga moving between postures. Mindless movement between postures without being aware of alignment can cause injury. For example, before spinal twists extending the spine and keep a neutral spine before rotating will help prevent the lower back from putting pressure on the spinal discs. Another example can be seen in sun salutations. Before moving from a lunge into a forward fold, students should lift the hips, ensure the back foot and knee is rotated forward, and if need be bend the knees in the forward fold once they step before or place blocks underneath the hands. Moving slowly and mindfully during transitions can support a safer practice for the back. To help keep the body balanced and the back protected strong abdominals to support the practice is key. Incorporating the asanas listed below can support a healthy back during a yoga practice. Chair pose is excellent because it not only strengthens the core but also the back such as the ankles, thighs, and calves while stretching the shoulders and the chest. In chair pose, the activation of the legs is important. Using a block between the thighs can help properly activate the legs and help maintain proper alignment. Chair pose can also be practiced with the back against the wall while building strength. A modified version of plank, child plank helps strengthen the core, arms, and legs while stretching the shoulders, hamstrings, and calves. It is a good option to build up to regular plank pose to help maintain proper alignment without putting too much strain on the lower back or the wrists. Not only is boat pose good for core strength but also the hip flexors and the spine, all necessary for back health. While it is a challenging posture, there are many modifications available so students can practice to their ability. This posture can even be done throughout the day by sitting in a regular chair. Simply sit towards the edge of the chair, hold on to the sides, bend slightly forward with a lengthened spine and life the feet off of the floor. Ideal for those building up strength for more of the challenging yoga postures, this helps tone the belly and work on balance at the same time. It also stretches the back of the legs, a common problem for people with back strain. Overstrain is not uncommon in yoga. The body needs ample time to recover from yoga practice. Taking a couple days off a week can help rest the body and allow the back to rest. However, if trying to maintain a daily practice, there are other ways to incorporate rest into a yoga practice. Try Restorative Yoga. As opposed to a daily vigorous practice such as Ashtanga yoga or Jivamukti, restorative yoga helps students slow down, soothe the nervous system, encourage mindfulness, and helps restore alignment in the body. Postures are held for longer periods of time and typically supported with a lot of props. Adding slower postures such as restorative yoga can help keep a regular practice but rest the body to help prevent overstrain on the back. Practice Yoga Nidra: Yoga nidra is a practice that involves no movement and an easy way to reduce stress. Yoga nidra is a guided meditation technique performed entirely in savasana and can be practiced for short periods of time. Placing a bolster or rolled up blanket underneath the knees can help support the lower back while practicing. Yoga is a practice with many benefits to the mind and body. While there are many benefits, it is important for practitioners to keep the back safe so they can practice continuously and frequently. By learning how to adapt their yoga practice to their needs, practice postures with proper alignment, practicing the yamas, and incorporating rest into their routines, students can practice for years to come.